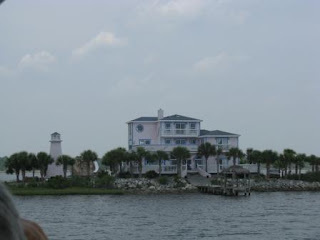 We left Charleston Saturday, June 14 and headed off shore. It was very hot – had been all week – and we were looking for cooler air. We had a good day out there - even had some excitement. 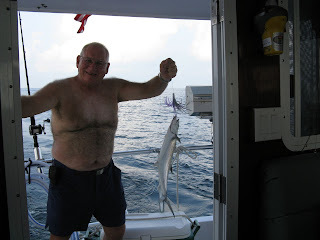 Joe tried fishing again and was successful! He caught this spanish mackeral. 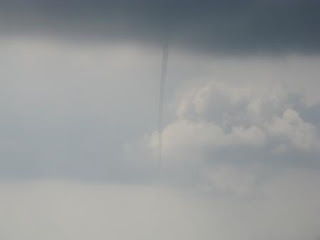 Joe, always the sky-watcher, had told me the clouds looked right for water spouts to form. 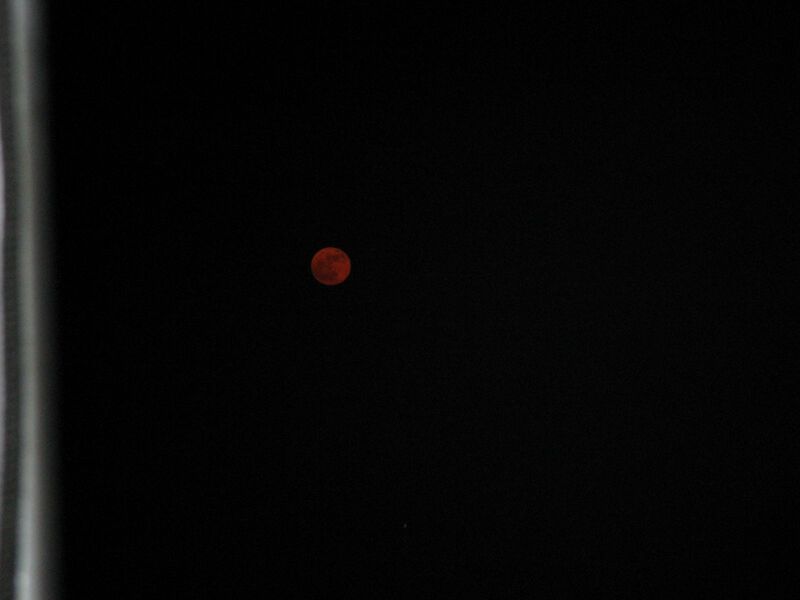 Skeptical as I was - here's the picture to prove it! 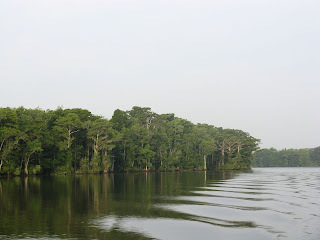 We came in late in the day and proceeded up the Waccamaw River to an anchorage behind Butler Island, north of Georgetown. 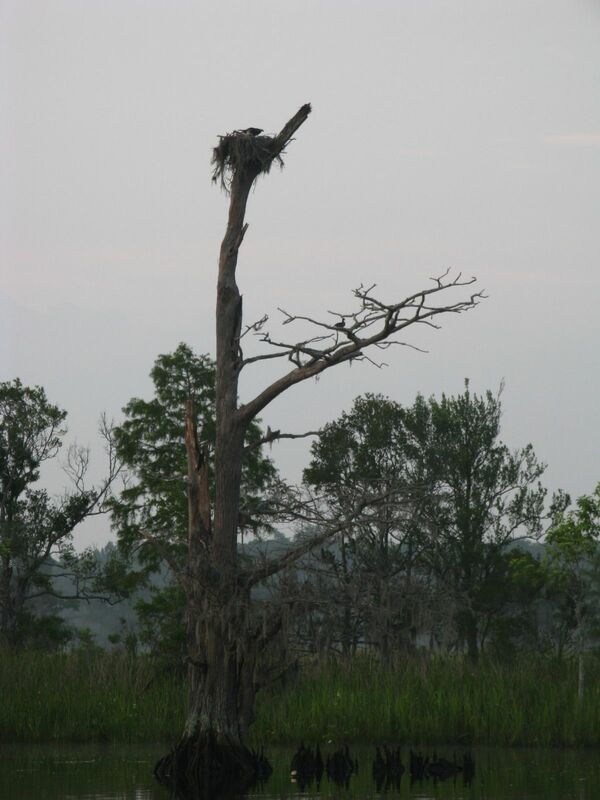 It was a nice spot next to a tree with an osprey nest. In the evening the tree also became a rookery for many white birds. Unfortunately, Joe had to fight the green-head flies to grill his fish so we mostly had to stay inside with the a/c on! 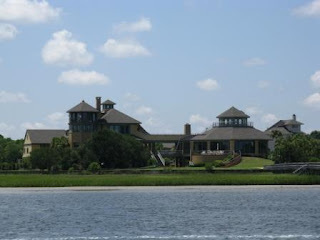 We stayed on the intracoastal the next day because of a threat of thunderstorms. It was an interesting trip behind the barrier islands. 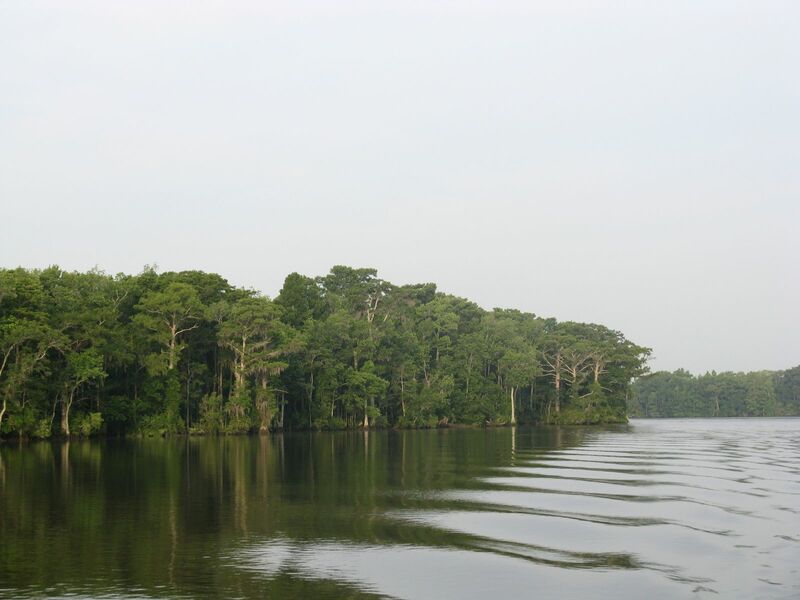 This is the Waccamaw River. 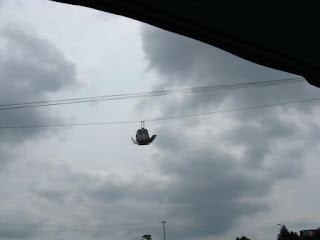 In Myrtle Beach we passed under “gondola golf carts.” Evidently they transport the golfers from the beach side to the mainland side where the golf courses are. We also keep being amazed at the number of people who seem to have unlimited funds when building their houses! We took way too many pictures to post here, but I'll load them onto the picasa site so you can take a look if your into that sort of stuff. 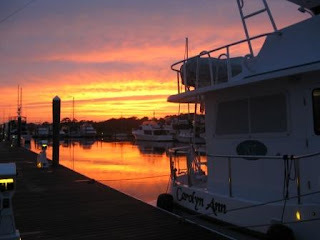 We decided on a marina stop that night in Southport, SC because of the storm that appeared imminent. As it turned out, we missed the worst of the storm, but met some interesting folks. We chatted at length with a couple that winters in Florida and summers in Maine. 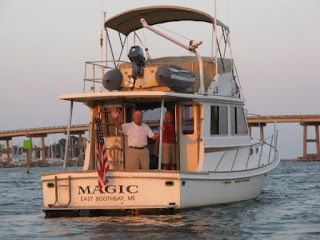 They’ve been making the trip back and forth in their current boat, Magic, for 12 years. They’re both 78 – wouldn’t have guessed it – and don’t have any plans to quit making the trip. There was a younger couple from Ohio, on a sailboat. They’d quit jobs and sold everything to move onto a sailboat three years ago. They travel and work along the way. As it turned out, he had recently painted Odyssey – the Great Harbour we had met up with at Jax landing. Small world. 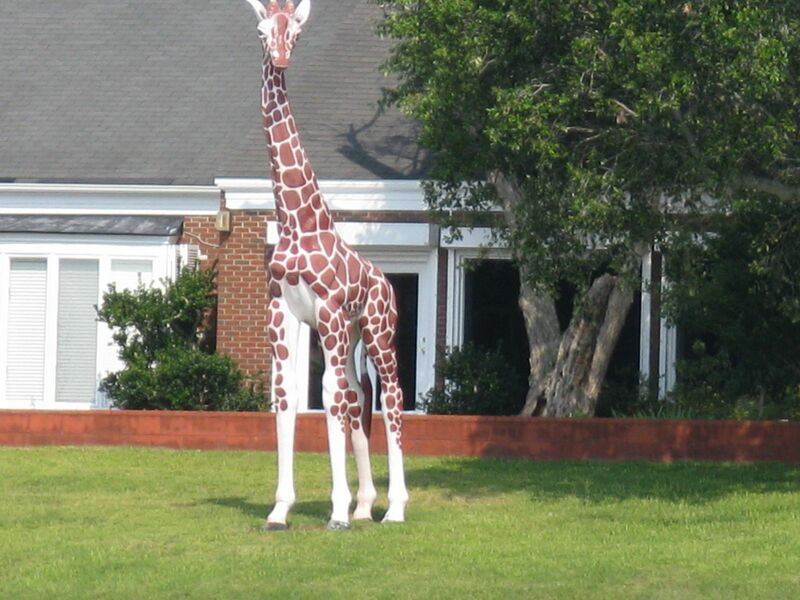 We got into an area that not only had unusual houses, but there seemed to be an odd proliferation of yard-art. There was the giraffe - this was actually the largest, there were other giraffes. I understood the mermaids and Loch Ness monsters, but giraffes? Then there was one that seemed to have a little of everything - a lighthouse perched on a rocky coast (like in Maine) surrounded by palm trees? It also had a large parrot, a wheel and anchor, an alligator, and several dolphins on it, the tiki hut on the pier and what appears to be a rock waterfall by the lighthouse. 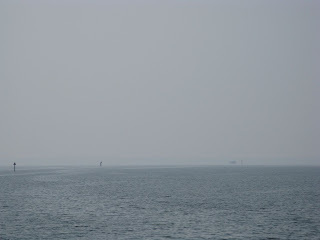 On the charts, to aid navigating the ICW, there are lines showing every five "statute miles." 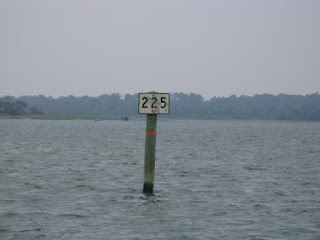 You can usually tell about where you are by also referencing channel markers or land marks, but in North Carolina they have errected mile marker posts every five miles! This was between Swansboro and Oriental, NC. You may have heard about fires in NC. We were not in sight of any of the actual fires, but we often saw and felt the effects of them. 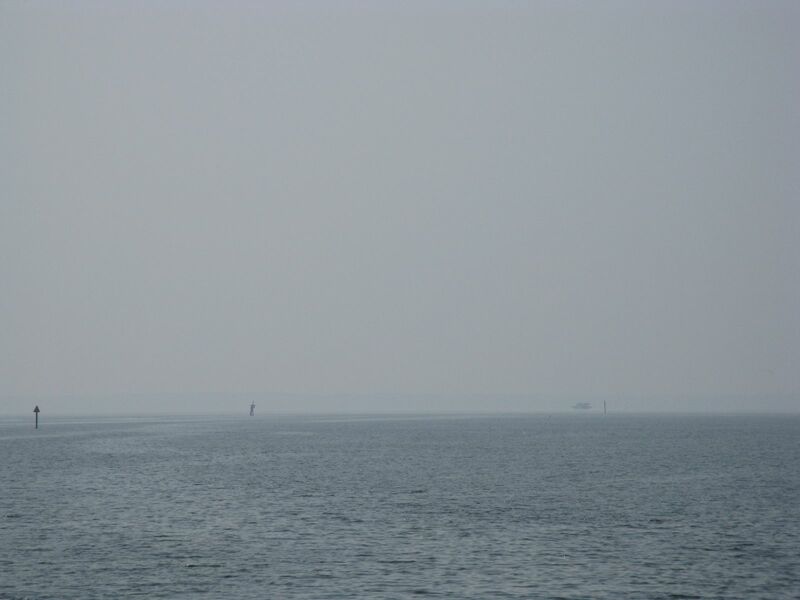 This is the smoke on the Neuse River. When we arrived in Oriental we checked out the free city dock, but found it occupied and went into nearby Greens Creek to anchor. As Joe was dropping the anchor, I checked out the trawler anchored nearby. It was Magic (Curt and Nancy), the folks we had met while waiting out the thunderstorm. They invited us over for happy hour so we never actually made it into Oriental - next time, maybe. 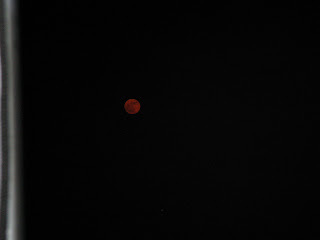 Missed the sunset shot - but here's the moonrise!